Music wasn't what brought singer Emi Evans to Japan. But it's what made her stay—and what is making her famous. With her work on Dark Souls and Nier, the British-born singer is quickly creating a name for herself. Evans is no overnight success. Hers is a long journey that began in Nottingham, England and one that began with little in common with the country where she found her calling. For Evans, despite having a Japanese mother, Japan felt like another world. "I think part of my disinterest in Japan was because, as I child I looked extremely Japanese and I stood out wherever I went-especially at school," Evans told Kotaku. "Although no one was particularly mean to me, it was always pointed out to me that I was ‘different' and this annoyed me so much that I just wanted to deny my Japanese roots and be completely English and 'normal' like everyone else." But the last thing Evans wanted to be was run-of-the-mill. For the first seventeen years of her life, Evans was interested in music. It was all around her at home from a very young age. She, however, wasn't interested in Japan, which is why she never really learned the language, save for words or phrases here and there. Yet, when around the time she was seventeen, Evans suddenly became very interested in Japan and, a year later, she visited for the first time with her parents. "I remember being so fascinated and overwhelmed by everything—the vibrance of Tokyo, the unfamiliar yet delicious food, the politeness of everyone—and what was the most overwhelming was to think that this amazing and exotic country was actually half of my own background," Evans said. "That made me even more determined to learn the language properly so that I could immerse myself in this newly discovered culture and learn as much as I could about my roots." Evans decided to study abroad at a Japanese woman's university. While Japan was clean and everyone polite, the budding songwriter found university claustrophobic: all the girls had the same hairdos, they all dressed the same, and they all had similar conversations. Instead of everyone trying to be different like back in England, Evans said everyone seemed like they wanted to be the same. There wasn't that desire to stand out—perhaps, akin to Evans' own desire back home to be "normal". According to her, "To release my stress I would go back to my student dormitory and blast out Eminem and write angry shouty songs on my guitar which helped a lot!" Evans, who is also an accomplished cellist, was increasingly becoming interested in expressing herself through music. However, she didn't want to be just another pop singer, like those clogging up the Japanese airwaves. Much of the Japanese pop music Evans heard seemed formulaic with many of the vocalists singing from the front of their throats and noses instead of from their stomachs. So much of Japanese pop music is based on formulaic chords designed to appeal to Japanese listeners. If Evans was to be a successful singer, she was advised to follow suit—and not draw inspiration from the likes of her biggest influences growing up: Radiohead, Tori Amos, Portishead, Alanis Morrisette, Massive Attack and Bjork. "I was horrified as I have always delighted in making scrunchy chromatic chords and throwing in unexpected harmonies," said Evans. "I really couldn't bare the thought of writing all my future songs based on these chord templates in order to sell, and it was that that made me realize that if I wanted to continue creating the music that I loved, it would be best to stay independent and I should expect to stay poor and struggling for quite a bit longer." While in Tokyo, Evans found a collaborator, arranger and composer Hiroyuki Muneta, who was also keen to push the boundaries of music and not simply churn out cookie cutter bubble gum pop, and the two formed the duo freesscape, which continues to release music and tour. The group rehearsed, made music, and cut demos. And Evans also threw herself into her singing, getting gigs singing at weddings, events, and lounges. The part-time singing gigs were a way for her to pay her dues, broaden her range, and network. "I feel that with the advantage of being in the minority as a foreign singer and speaking Japanese, there are so many opportunities to network and meet composers and producers—and as the music world population in Tokyo is so dense and often interconnected, once you've established yourself a little bit then word of mouth spreads quickly," Evans. The group's music started appearing in mainstream Japanese commercials—and doing it by playing by their own rules and refusing to produce standard J-pop. But perhaps Evans' biggest break would come from the video game world. After making her game song debut in Nintendo DS title Etrian Odyssey, Evans didn't only create some truly memorable music for Nier—she invented languages to sing it in with 2010 role-playing game Nier. "I took existing 'real' languages such as French, Japanese, and Gaelic and then imagined how they might sound after thousands of years had passed," said Evans. "The aim was to create lyrics which sounded fantastical and otherworldly but yet just familiar enough to grab the listeners attention and make them think, hang on, what language is this? I've heard this before somewhere!" Working under a tight deadline meant that she wasn't able to create a series of grammar for each lingo so that fans could learn and speak them. For last year's Dark Souls, Evans wasn't asked to create languages, but sing the ending theme "Nameless Song". "I did offer to make up lyrics in a mystical language but the guys at From Software told me they just wanted "aaah" this time," said Evans. "They gave me a very detailed explanation of the scenario behind the song and even during the recording I was given specific instructions of how to sing—not in my usual soft, warm, breathy voice but a thinner cooler tone using less breath." Singing long phrases in a single breath proved challenging, but she eventually was able to capture the game's mood. "In these last couple of years of being closely involved with the game music world, I've learnt how important music can be to bring emotion and excitement to the players and I've really felt lucky and delighted to have had the opportunity to bring something special to gamers around the world," said Evans. Most Japanese pop music is formulaic, but Japanese game music is anything but, and composers and lyrics aren't afraid to take chances and try new things. 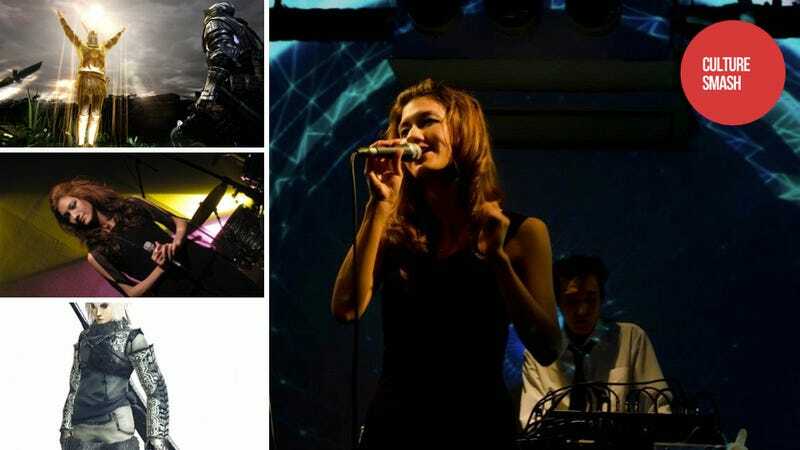 While Evans achieved her dream of making a career in music five years ago and did so on her terms, she's found that creating, recording, and performing game music not only inspires her, but gives her the creative freedom she's always valued. (Top photo: Yuriko Iwasaki freesscape/Emi Evans | Facebook) Special thanks to Kotaku Japan.